Design by Roberto Capucci, ca. 1980-97. 1991; La Biennale di Venezia, Centenary 1895-1995, Venice, 1995; In difesa della bellezza, Palazzo della Pilotta, Parma, 1996; L'elogio della bellezza—Roberto Capucci alla Galleria di Palazzo Colonna, Rome, 2000. Awards: Medaglione d'Oro, Venice, 1956; Filene's Fashion Oscar, Boston, 1958; honoured by the Austrian Minister of Culture 1990. Address: Via Gregoriana 56, Rome, Italy. Roberto Capucci: L'arte nella moda—colore, volume, metodo [exhibition catalogue], Fabbri Editore, 1990. Roberto Capucci: Roben wie Rüstungen [exhibition catalogue], Vienna, 1991. Roberto Capucci: Testo Italiano = Texte Français = English Text, with Patrick Mauriés and Massimo Listri, Milan, 1993. Roberto Capucci: I percorsi della creativitá [exhibition catalogue], with Massimo Ferretti, Rome, 1994. Roberto Capucci al Teatro Farnese [exhibition catalogue], with Lucia Fornari Schianchi, Rome, 1996. L'elogio della bellezza—Roberto Capucci alla Galleria di Palazzo Colonna [exhibition catalogue], Rome, 2000. Relang, Regina, 30 anni di moda, Milan, 1983. Buiazzi, Graziella, La moda italiana, Milan, 1987. Bauzano, Gianluca, Roberto Capucci: Timeless Creativity, Milan & London, 2001. Pivano, Fernanda, "Roma alta moda: Roberto Capucci," in Vogue (Milan), September 1985. "Roberto Capucci: Sontuose magie di un grande alchimista," in Vogue (Milan), March 1987. Hume, Marion, "In Love with the Frill of It All," in the Sunday Times (London), 14 January 1990. Gastell, Minnie, "A Solitary Artist," in Donna (Milan), March 1990. Battaglia, Paolo, "Lo scenario per gli abiti scultura," in Abitare con Arte (Italy), May 1990. Mölter, Veit, "Die Kunst der Mode," in Parnassus (Germany), July/August 1990. Bertelli, B., "Quando la moda é arte," in F.M.R. (Italy), September 1990. Celant, Germano, and Massimo Listri, "Roberto Capucci," in Interview (New York), September 1990. Vergani, Guido, "Il sofá delle muse," in Il Venerdí di Repubblica (Rome), September 1990. Hilderbrandt, Heike, "Florenze: Art and Fashion," in Contemporanea (Vienna), November 1990. Plener, Doris, "Roben wie Rüstungen für Groâe Festlichkeiten," in Die Presse (Vienna), November 1990. Kruntorad, Paul, "Drei Wiener Schaustücke Zur Gegenwart Von Harnischen," in Der Standard (Vienna), December 1990. Morteo, Enrico, "Il lusso come ricerca," in Domus (Milan), February 1991. Celant, Roberto, "Capucci," in Interview, September 1991. Wagner, Steven, "A Cut Above [Capucci]," in Town & Country, July 1994. "Fashion Scoops," in Women's Wear Daily, 11 July 2001. I first became curious about fashion as a child, when I observed, with a critical eye, the clothes worn by the women of my family. My talent for design and love of colour led me to art school, the Accademia delle Belle Arti, where I came into contact with art in its many forms. Eveningwear by Roberto Capucci, modeled on the Spanish Steps in Rome during the "Donna sotto le stelle" ("Women Under the Stars") fashion gala, 1999.
and colour. This has given me the strength to avoid being influenced by fashion trends. Following my belief has enabled me to be true to myself, but this has meant renunciation. If my work lacks a commercial aspect, it is due not only to my desire for truth. For me, creating is a great experience and, while I would not have refused to diversify in my designs, the moment is not yet right. In this field, it is difficult to strike the right balance. To attempt a compromise between the will of the designer and that of the manufacturer inevitably leads to disappointment. On one side, industry takes a commercial stance; on the other the designer has an idealized view of fashion. Creating a design away from the reality of a woman, the dress has no form, it is merely a symbol. In my continuing quest for beauty and purity, I concentrate initially on the basic form. During this phase I do not want to be influenced by outside factors, and I think in black and white. Next comes colour, in all its intensity, blending with the pencil lines and producing the effect that I am looking for—faithful to my concept and to the women I am addressing. Only today is my work understood and accepted. Because it is a work of luxury, it may be enjoyed by a few, but by those few who have a sense for luxury rather than the desire for ostentation and opulence. Luxury does not necessarily mean money. One can, perhaps, say that luxury is an art, like painting or sculpture, with its own scheme. To be inspired by art does not mean to imitate it, nor to establish a recognizable connection with it, but almost to fall in love with it. This is the feeling of culture for clothes and fashion which, as I said before, is sadly lacking today. I am confident, nevertheless, that everyone wants to follow their own style rather than to conform. One of Italy's most gifted and imaginative couturiers, Roberto Capucci has a select following of women who appreciate his architectural creations, and have the grand occasions on which to wear them. Having a Capucci wedding dress has long been the goal of fashionable brides looking for a special sense of shape and style. Capucci is an uncommon couturier who shows infrequently, and produces only a few extraordinary designs for his clients. The retrospective held at the Palazzo Strozzi in Florence in 1990 highlighted the variety of his genius and the sources of his art. The elegance of the 1950s shaped his concept of haute couture as an art form, and he has rigorously practiced it in this tradition. He has approached design as a form of architecture, building structures the body can inhabit, and has rejected the arbitrary dictates of what might be momentarily fashionable. Instead he deals with elements of design such as line, color, texture, and volume in a more abstract sense but always as they relate to the human body. Capucci's sense of line can be found in the geometric planes imposed upon the body and apparent both in his sketches and the finished garments. The sketches show strong relationships with the work of the Italian Futurists, and some of his work has also been considered surrealistic. His second major source of inspiration draws from natural forms, where curvilinear volumes might refer to floral shapes while the linear, planar qualities might refer to crystalline structures. There can be no question of his mastery of the use of textiles. Crisp, lustrous silks are pleated and manipulated into moving, fluted sculptural forms; wools are cut and inlaid like mosaics. The care with which he works his materials into his humanly habitable structures ensures that they are wearable and the finished garments are true to his original concepts. Many of the textiles are a combination of silk and wool, in fabrics with the weight and resilience needed to execute his complex volumes. Capucci's sensitivity to color, or its absence, is equally impressive. In the black and white costumes, where the linear qualities are dominant, the absence of color is used for emphasis. 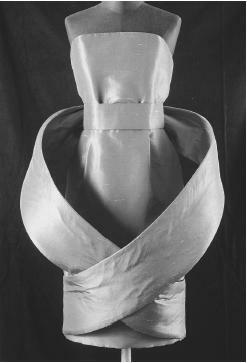 One series of white silk crêpe dresses from 1980 had mask-like human faces sculpted into the structure of the sleeves, pockets, or bodice front. In combination, the use of black and white served to make the spatial relationships even more effective. 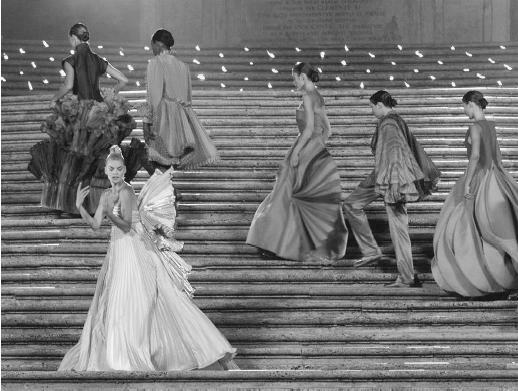 Instances of Capucci's dramatic use of color are usually found in his evening dresses of pleated silk taffeta. The brilliant colors, often juxtaposed in close harmonies, give added dimension to the linear effects. The strength of Capucci's personality and his determination to remain true to his chosen art are obvious in his designs. His interest in seeking a variety of forums in which to display his work, like the many exhibitions featuring his creations, demonstrates a creative approach to establishing a context for his work. Many such opportunities have arisen in the 1990s, like his participation in the Venice at La Biennale di Venezia Centenary celebration in 1995, where Capucci was an honored guest alongside a few of his treasures. The designer surprised many in 2001, however, when it was announced he had secured financial backing and would present a new collection in Paris later in the year. A renaissance for the Italian house of Capucci was on the horizon, and the designer's devoted clients awaited his newest works of art.